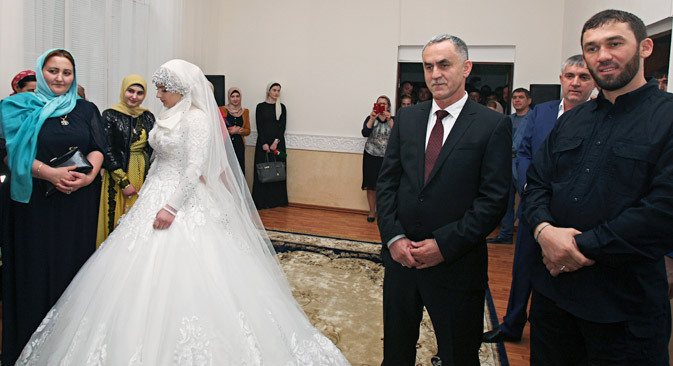 The wedding between a 47-year-old policeman, who already has a wife, and a 17-year-old Chechen girl has caused controversy in Russian society and outraged human rights activists. The newlyweds have received public backing from Chechen leader Ramzan Kadyrov. RBTH reports on how the story developed and asks experts to comment on the legality of marriages like these. Since late April, Russian media have been following the story of 17-year-old Kheda Goylabiyeva, a girl from a village in Chechnya in Russia’s Caucasus region, who it is alleged has been forced into a wedding with the married head of a local police department, 47-year-old Nazhud Guchigov. The news of their impending wedding was first reported by the liberal newspaper Novaya Gazeta, which said that the girl’s parents had “categorically” refused “to wed their daughter to a man who was old enough to be her grandfather” but the family had been threatened and told that otherwise the girl would just be taken away from them by force. Novaya Gazeta contacted the prospective groom, who denied that he had any intention to marry Goylabiyeva, adding that he already has a wife. However, shortly after that the news of the marriage proposal was confirmed by Chechen leader Ramzan Kadyrov (who knows Guchigov personally). He later voiced his support for the proposed marriage, saying that the parents of the bride had no objections to it. The story culminated with the announcement that the wedding will go ahead. “The age difference is 30 years. The girl’s parents have blessed the union,” Kadyrov wrote on his Instagram account. The ceremony took place on May 16. This scandal has already cost the Chechen press and information minister his job. The official took the blame for the failings of the local media, which, according to Kadyrov, decided to ignore this controversial story and did not seek out the truth. “Everybody is talking about it, all the papers! Why aren’t you reporting it?” an indignant Kadyrov enquired at a meeting with representatives of the Chechen media. In this way the debate over Goylabiyeva, who allegedly was being forced to marry “an old man” and made into a second wife under sharia law, reached the federal level. Russian parliamentarians criticized the ombudsman for such passivity, reminding him that under the Russian Constitution, the rights of mothers and children are under the protection of the state. Later, talking to the Russian News Service, Astakhov said that early marriages in the Caucasus were a regular occurence, whereas the age of consent for marriage was set by the regional authorities. “In Chechnya, the age of consent is 17, in Bashkortostan, 14, in the Moscow Region, 16. There are [regions] where a marriageable age is not set at all,” he said. Kremlin press secretary Dimitry Peskov, meanwhile, implied that the government was unlikely to take action over the union: “We do not manage weddings,” Peskov told the RIA Novosti news agency on May 18. Having said that, people there are not used to complaining about these things, “which is why they do not ask for help,” Shvedov added. “Another reason is that there are no clear mechanisms of state support in cases like these,” he explained. While objections to the age difference were countered by numerous examples of various celebrity couples with a similar age difference, the matter of polygamy provoked a public outcry. The head of the presidential human rights council, Mikhail Fedotov, has complained to the prosecutor’s office, while human rights ombudsman Ella Pamfilova has appealed to the Chechen leadership. Under the law, polygamy in Russia is banned, however, in some – predominantly Muslim – republics, things are not so clear-cut. Namely, under sharia law, a man is allowed to have up to four wives. While these marriages are officiated by imams or qadis (judges ruling in accordance with Islamic law), “they do not have legal force and therefore do not envisage any legal relations,” said Vladimir Bobrovnikov, head of the Caucasus section at the Russian Academy of Sciences’ Institute of Oriental Studies. Kamilzhan Kalandarov, the leader of the public Muslim organization Al-Haq (Justice), told RBTH this is not about a conflict between sharia and national law. The registry office in Chechnya has never registered a man’s marriage with several women, he continues.